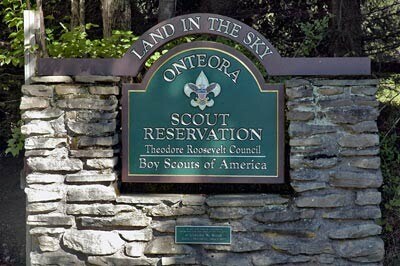 Located in the heart of the Catskill Mountains, the 1400-acre and 2000-foot altitude, Onteora Scout Reservation (or OSR) is affectionately referred to by those who have experienced the camp as "Land in the Sky." Upon arrival at OSR, you will be met with a traditional greeting of "Welcome Home." Boy Scouts of different rank and age will have a wide variety of programs to choose from. While OSR is rooted in tradition, its programs are developed with the needs of today's scouts and leaders in mind. The Theodore Roosevelt Council's priority is to provide a top notch resident camping experience at OSR supported by a well trained staff committed to exceptional customer service, great food, a variety of program and well maintained facilities. Our campsite is called Flathead. Scouts tent in pairs in the canvas platform tents. The theme this year is Marvel v. DC. Please review the Program Guide below for details about this year's many programs, events and activities at camp. Cost: $440 if paid by 5/09/19; $490 if paid after 5/09/19. Scouts who made a deposit or paid early (click here for list) will have access to online registration a month before the rest. Some programs like Paintball and ATV as well as certain merit badges require additional fees, which should be included with payment. Adults are free, but must be fully trained/registered ASMs to attend or take the training course at Onteora. Scouts must select their merit badges months before so we can register them. The merit badge schedule is below. Scouts should complete the registration form themselves. NOTE: Scouts are expected to stay the entire week of camping, unless they have received clearance ahead of time to leave early for exceptional circumstances. Scouts and leaders attending camp must supply BSA health/medical forms Parts A, B & C PLUS - if applicable - a letter indicating any prescription medication the Scout will take at camp. Start at our Quick Tips page before submitting any health forms. 4/11/19: Merit Badge Registration Form for early bird Scouts ONLY. Provide the above to ASM Simone in person or mail/drop off (38 Marino Ave, PW, 11050). Once the Scout is registered with the camp, payment is not refundable. *MAKE M.D. APPOINTMENTS/GET PART C FORM TO M.D. NOW. Issues concerning late medical forms may have to be addressed directly with Theodore Roosevelt Council.